Formula E may be known for racing on street circuits, but that’s mostly because they want to host races in the middle of cities. They really prefer close-in locations that allow them to race without shutting down city streets. One such spot that was briefly considered for New York City’s first-ever ePrix was none other than Central Park itself. Formula E CEO Alejandro Agag had a call with several media outlets including Jalopnik ahead of this weekend’s New York City ePrix double-header where he explained some of the quirks of site selection. According to Agag, New York City entered the conversation as a possible race location after the city’s Deputy Mayor for Economic Development Alicia Glen came to one of Formula E’s races in Paris. Glen became an instant fan and was a major help with hunting down a site for Formula E to race. Of course, a New York City ePrix needed to be in one of the five boroughs of New York City itself. Minimizing traffic disruption was also a big concern, as we’re talking about a city that seems to exist in perpetual gridlock on a good day. Shutting down streets is madness—pure madness. This led to at least one place where you’d never expect to see race cars making it onto the possible list of sites early on. The 843-acre Central Park—the single most visited urban park in the United States—would certainly have the room to host some all-electric race cars. As we know now, the park turned out to be a non-starter. Some of Central Park’s lovely mature trees would have had to go in order to make a safe track to race on, and that was a hard no for a racing series trying to promote itself as the cool new environmentally-friendly future. 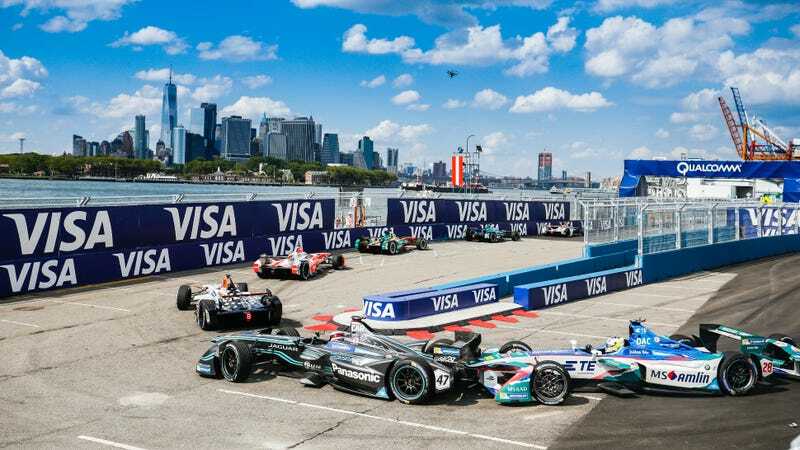 Fortunately, Formula E was able to find a cruise terminal in Brooklyn that was big enough to host its race weekend without clogging up NYC’s public roads. There, the series made improvements to the pavement to ensure the cars could run fairly smoothly on Formula E’s temporary NYC ePrix track, Agag said. The ferry landing was also extended for more room, and some sidewalks and entry points were reconfigured. In other words, Formula E did a whole lot of paving. As much as I love racing, I’m a little glad Central Park didn’t receive any additional pavement to make it happen there. With the skyscrapers of Manhattan and the Statue of Liberty visible from their current Brooklyn site, though, I don’t think the series is hurting for scenery this weekend.